The AVANTI IF 95 is a high performance model for advanced to expert women skiers featuring high tech good looks and innovative architecture. 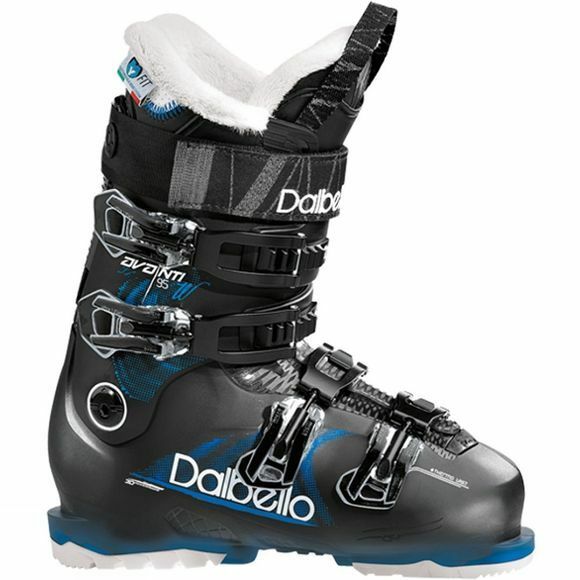 Dalbellos Fit for Women construction combines a unique 99 mm Contour4 shell last with lower cuff profile fit and Center Balanced Rocker Stance to encourage natural balance and to improve ski feel for better control with less fatigue. The Avanti IF 95 also comes equipped with custom heat moldable IF Comp innerboots that are super lightweight, warm and precise. When you buy ski boots from us, we always do our best to ensure they’re the best fit for you. If any problems arise before you go skiing, we will refit or change your boots at no extra charge and refund the difference if you choose a cheaper model. For full details, see our terms and conditions. Before you head off on your ski trip, take the opportunity to try out your new ski boots at either of our snow slope locations. If you experience any fit issues, then it’s a quick visit to either our Hemel Hempstead or Chill Factore Manchester boot lab, free under our Boot Comfort Guarantee.